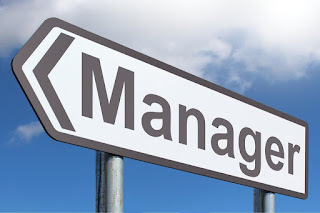 RussJones.Us: Are You In Management? Management and Leadership are two different things. Leadership casts the vision, the idea, the cause. Management figures out a way to make it happen. Managers don't own what they are using, they just are the caretakers of it. The manager of Wal-Mart doesn't own the store. Sometimes you will see the title, owner/manager. I see this quite often in restaurants. When it comes to being a follower of Jesus, we understand that we are in management. God gives us different gifts to use in accomplishing His mission to reach hurting people who need Him. There are the Romans 12:6-8 gifts. 6 Having gifts that differ according to the grace given to us, let us use them: if prophecy, in proportion to our faith; 7 if service, in our serving; the one who teaches, in his teaching; 8 the one who exhorts, in his exhortation; the one who contributes, in generosity; the one who leads, with zeal; the one who does acts of mercy, with cheerfulness. There are the 1 Cor 2:8 - 11 8 For to one is given through the Spirit the utterance of wisdom, and to another the utterance of knowledge according to the same Spirit, 9 to another faith by the same Spirit, to another gifts of healing by the one Spirit, 10 to another the working of miracles, to another prophecy, to another the ability to distinguish between spirits, to another various kinds of tongues, to another the interpretation of tongues. 11 All these are empowered by one and the same Spirit, who apportions to each one individually as he wills. Each of you has a gift. Most likely you have more than one. When we discover those gifts, we mistakenly believe that we have been promoted to some higher plane of holy existence above others! Nothing could be farther from the truth. It only means you've discovered what was in you the whole time. The question is, "Will you be a good steward of it?" Which means. Will you use it with humility? Will you use it to build the Kingdom of God? Will you be generous but responsible for using it? Will you acknowledge that you don't own it, that it belongs to God? Are you a good manager (steward) of what God has given you?